Cover and back art of the game. 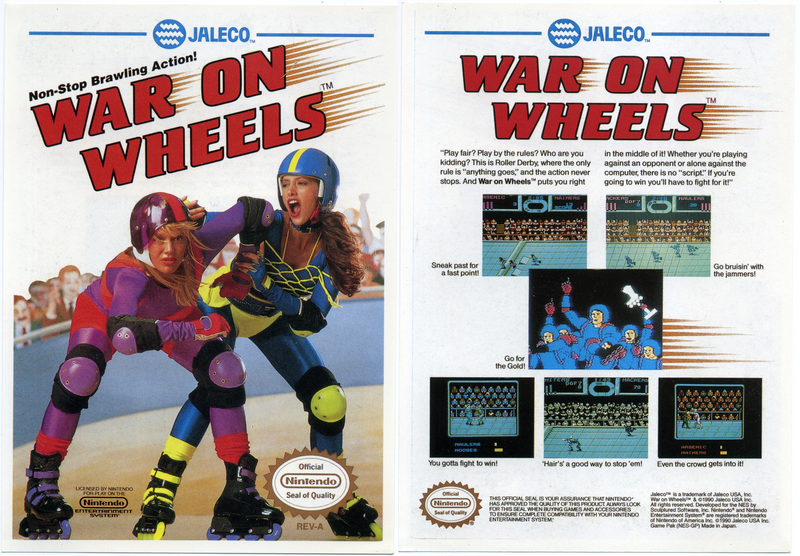 War on Wheels is a cancelled 1991 roller skating game developed by Sculptured Software and published by Jaleco USA. The game would had a two players mode, and like Road Rash, it was possible to beat up your opponents. The game was cancelled because it got bad reviews on video game magazines. On June 2nd, 2006, Jason Wilson, aka DreamTR (who previously owned the prototypes of Socks the Cat and the cancelled English release of Metal Jack), found a prototype of War on Wheels and he would later release game as a cart release in 2010. At the end of 2013, a ROM of the game was leaked online and can be found fairly easily. War on Wheels prototype rom. ↑ A DreamandFriends blog. Retrieved 06 Feb '16. ↑ digitpress.com forum thread. Retrieved 06 Feb '16. ↑ NintendoAge.com reproduction run. Retrieved 06 Feb '16.